Embed codes work the same way as a youtube video embed. Just copy the code and paste it into the tab. You’ll see a tab called index.html – that just means the main part of your tab. Paste the code from interact into this page to have your quiz show up. Step 4: Click ‘save and publish’ and you’re ready to go! Check out this example from the UC Davis associated students page. 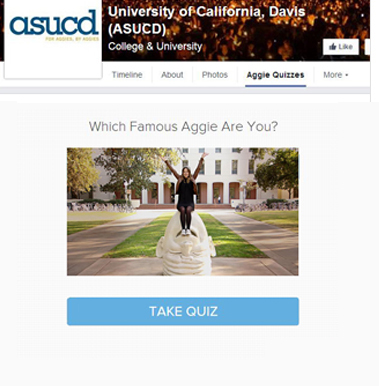 They created a quiz aimed at new students to help them get to know the school and its history. The quiz is embedded in a tab to act as a more permanent part of the page instead of like a status update that quickly disappears.